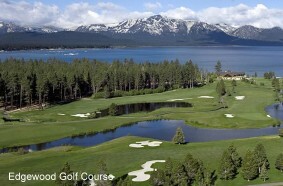 Top off your vacation plans with a day at on one of the fantastic South Lake Tahoe golf courses. These courses are some of the most scenic courses in the world, set in the pines of the Sierra Nevada Mountains and near the shores of crystal clear Lake Tahoe. Whether you are looking for a challenge or just a relaxing day with friends, South Lake Tahoe golf courses will offer an memorable experience. Test your skills at Edgewood Golf Course. Rated as one of America’s Top Golf Courses by Golf Digest Magazine, this scenic and challenging course is host to the American Century Celebrity Golf Championship. Feel the excitement at Lake Tahoe Golf Course, which offers amazing value for a remarkable experience, plus the splendor of golfing in a mountain meadow surrounded by towering vistas. Tucked away in a gorgeous pine forest is the Tahoe Paradise Golf Course. With affordable rates and a professional staff, your experience will rate among the best. South Lake Tahoe golf is a one-of-a-kind adventure. There is nothing quite like clearing your head for that perfect drive by breathing in the crisp and clean mountain air of the Sierra Nevada Mountains and glancing at the sparkling waters of Lake Tahoe in the distance.